1 Les Fontaines: From the main Little Sark road take the track to the right just before Duval Farm, then immediately left with the carriage park on your right. Do not go through the gate ahead, but swing around on the track to the right with a stone-built house ahead. Go through the gate, left before reaching the house and cut down through the field keeping to the right of a gorse hedge ahead. Soon you reach a grassy path that dips downwards to a stile/wooden gate. Here you can turn left and follow an easy path down to a fishing platform and viewpoint – or turn right and with care follow the steep steps and path down to the creek. From here there is much to explore on the rocky shore and swimming is very good, especially from half tide to high water. 2 Adonis Headland: As in walk 1, take the track to the right just before Duval Farm, then immediately left with the carriage park on your right. Go through the gate ahead, then a second gate. Cross the field to the stile slightly to the right and diagonally ahead. Turn sharp right on the path that skirts the inlet (take care) left and then bares seawards on short turf towards the headland. This provides excellent views in many directions and the rocks are covered in maritime lichens and flowers. For the agile and energetic – Adonis Pool: Scramble down the gorse and rock of the headland on a feint path to reach a platform below. Adonis Pool provides a good swim and lies on the detached rock to the south. At low tide, with the help of a partner, you can cross the gully via a boulder. This is a big leap and should not be attempted except during low tide and with a helping hand. 4 Venus Pool: Low water (less than 2 hours before and after low tide) is required for access and this is preferable in the morning because of the light. From the main Little Sark road turn left in front of La Sablonnerie on the gravel lane sign posted ‘To Venus Pool’. Go through the gate ahead to Venus Pool and walk down the rutted track (Silver Mines ventilation chimneys on the right) until you reach a double cairn set in the open area above the cliff face. Follow the feint path along the line of cairns and proceed forwards down the rocky slope (take care, slippery crumbling rock) until you reach a white vein of quartz rock. Follow this to the left and you come to Venus Pool beyond a wall of rock. If you are lucky to have sun, this can be a very pleasant swim. 5 Port Gorey: Take the gravel lane from La Sablonnerie as if going to Venus Pool (walk 4). Once through the gate, turn right and descend down the grassy path. Keep on this grassy path, ignoring turns to the right and left in a dip near the bottom. You will pass a bench and ruins of Silver Mines buildings on the left. The path runs along the course of the old tramway and reaches a rocky promontory from which good fishing and swimming in Port Gorey (half-tide to high water) may be enjoyed. On the right is a ladder which helps both swimmers and sailors. 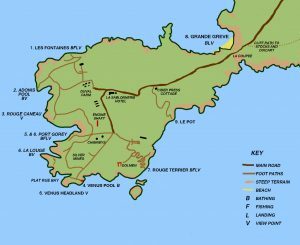 6 Venus Headland – La Louge – Port Gorey: Proceed as if going to Venus Pool (walk 4), but just before the cairns are reached, bear right to visit the causeway on the western side of Venus Headland. This may be an ancient landing track, dating back to the Romans. Follow the path which rises steeply towards the west up the grassy slope above Plat Rué Bay caves that provide souffleurs. Clearings in the fine turf provide good sites for wild flowers. The narrow path continues, cutting close to the edge at La Louge (care). This is a spectacular inlet with a tunnel, through which the tide rushes, cutting through a smaller headland on the east. The light there is magic, varying at different times of the day. For the agile explorer: A few metres beyond the La Louge viewpoint, a feint track (often overgrown with gorse) branches to the left and then carries downwards over the spoil heap, then left over some rock to reach the western side of La Louge. Here there is a large pool, Teddy Bath (Gorey Pool), which can provide a dip. Swimming and exploring off these rocks in La Louge are excellent. The main path above La Louge continues westward to meet a junction, from where you continue straight ahead to rise steeply along the grassy path which leads to the gate at the beginning of your walk – or turn sharp left to Port Gorey, or left a little further ahead to Rouge Caneau. 7 Rouge Terrier: Proceed along the lane from La Sablonnerie towards Venus Pool. At the gate (which you do not go through) the lane swings left and you face a private gate. Here turn right on the path sign-posted to Rouge Terrier. Follow the signs and path, crossing over a stile and around the field margin to another site. Just a little further on the path, taking a right branch you reach a magnificent 3000-year-old lichen-encrusted dolmen (which can be seen from the Venus Pool walk). This is the only intact dolmen remaining in Sark. Return to the main path down a well-constructed switch-back. About half way down, a path left leads to the Pignon landing which is good for fishing but is a steep descent. Continue down the main path, which also becomes steep, to the rails at the Rouge Terrier landing. Take care over the rocks. Rouge Terrier provides good fishing and swimming at half-tide-up (especially in the morning light). At low water La Brenière can be visited, but avoid currents between the island and landing. Rock Sea-lavender and Golden Samphire are found flowering in late summer at Rouge Terrier. 8 Grande Grève: Looking down 300 feet over the western side of La Coupée no one can fail to notice the many steps leading down to this sandy beach flanked by rocks. Grande Grève is at its best in the afternoon and evening light when the tide is out and the swimming can be enjoyed from the beach, and explorations can be made into the rocks and pools adjacent. Upon leaving Grande Grève, the most interesting walk back to the village is by the coastal path to Dixcart and Stocks. PLEASE NOTE: after recent rock falls the path has been rebuilt, and must be undertaken with GREAT CARE at your own risk. 9 An extra exploration for the agile explorer: Le Pôt can be reached from the east side of the main road in Little Sark. Just south of Cider Press Cottage there is a stile which takes you to Pôt Field. Keep to the edge of the field (beware of bulls), walking towards the sea, then turn right at the far end of the field. Go over a fence in the south-east corner of Pôt Field. Take the grassy zig-zag path leading gently down the cliff (good views to the east, especially). This leads you to the point of descent into Le Pôt, which is a very large creux. The descent involves a steep path and use of ropes should only be attempted by the agile, strong scrambler – and at low water. Interesting pebbles and rock formations are to be found at the bottom of Le Pôt, but remember you must ascend the creux for your return! With thanks to the Perree family. Boddye, E. 1996. Walks on Little Sark. The Guernsey Press Co. Ltd.
Latrobe, G & L. Third edition, 1964. 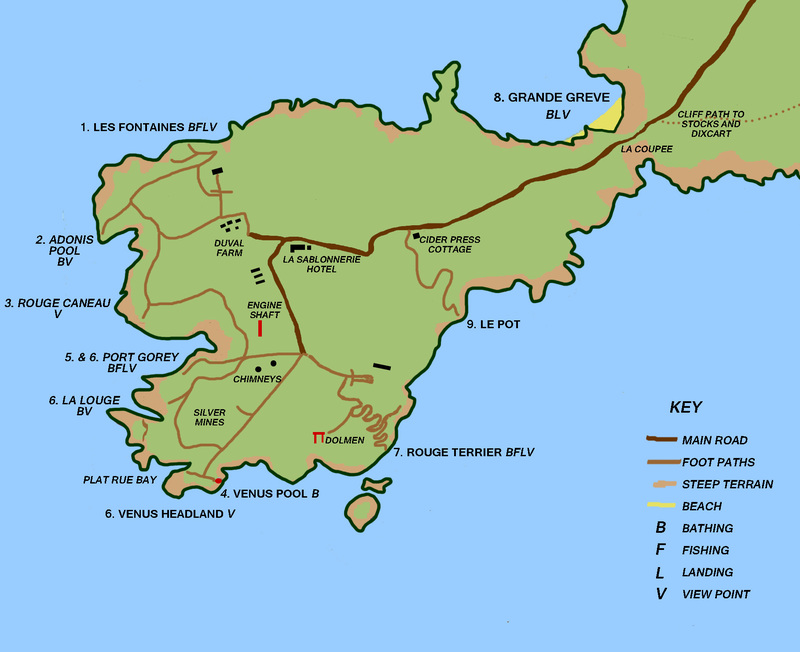 Guide to the Coast, Caves and Bays of Sark. The Guernsey Press Co. Ltd. Please note that footpaths described in this text do not constitute a right of way and may or may not be open throughout the season. Please keep to the lanes and footpaths and use only designated stiles/steps. Do not walk too close to the cliff edges or any over-hanging ledges. 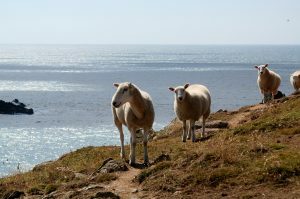 The Isle of Sark administration and the private landowners cannot be held responsible for any accidents, no matter how they might be caused. Please ensure that before you embark on a trip to our exciting low water environment you carefully check the tide times, which change daily. The Visitor Centre displays up-to-date information every day. You also need a good standard of fitness to embark on any of these expeditions.